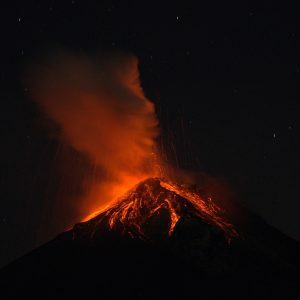 Guatemala’s Volcan de Fuego, which means “Volcano of Fire” in Spanish, has erupted near the colonial city of Antigua, causing widespread devastation. Ash and gases have covered large areas of ground, with layers of ash knee-deep in places. The eruption was visible from space, with satellite footage showing the ash cloud as a massive dark gray mass. The sudden eruption killed dozens, erased hillside communities, and destroyed farmland. Hot gases, rock, and ash raced down the volcano in a fast-moving pyroclastic flow, which can travel at hundreds of kilometers per hour. The villages were right on the foothills of the mountain, making it difficult to escape. The pyroclastic flow destroyed nearly everything in its path. The Fuego volcano is one of Central America’s most active. Officials said more eruptions could be on the way. Authorities urged residents living near the volcano to evacuate immediately. Residents in the surrounding areas were told to be on alert for mudslides containing volcanic material. The death toll from Guatemala’s volcanic eruption is currently at 69, but is expected to reach into the hundreds. Many of the victims have been buried under hot, volcanic ash in areas that are virtually inaccessible to rescue workers right now. Heat from the ground is so intense that it is damaging the soles of some firefighters’ boots and recovery workers are having difficulty breathing while they work. The eruption has affected 1.7 million people, according to CONRED, the Guatemalan disaster relief agency. More than 3,100 people have been evacuated. Guatemala’s National Institute of Forensic Sciences says that 17 people who died have been identified. Most of the victims were from the city of Hunapu in Escuintla state.